I find exams a great place to check out what people are wearing (I know, that's the last thing that should be on my mind, but I can't help myself!). On one of my exams, I noticed this girl with really gorgeous boots on the way in. 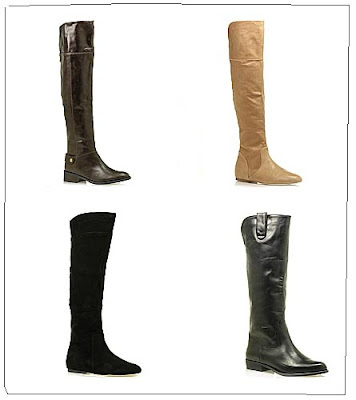 They were nice and sleek, more like riding boots than the slouchy kind you see nowadays. Of course, I set my sights on those boots, and started looking around for a similar pair. Anyway, my already scuffed up boots recently got even more scuffed up, to the point where I had wet heels whenever I walked in the rain, and I decided it was high time to get a pair of new boots. The shopping centre on Spencer Street is a great place to get good items at good prices, so I'm going there tomorrow. I looked online a little to see what kinds of boots the various stores had in their collections, and I really liked what I saw at Tony Bianco. Despite wanting a pair similar to the girl's riding boots, I am thinking of buying a different pair, just so it matches the clothes I usually wear. I like Lenni because the colour I chose (Cedar) has this lovely brown tinge, which I think would match all the nudes that I have. I also cannot tear myself away from my love for suede - Pop has both leather and suede finishing, and I think the suede one looks great! Okay, enough gushing. Check Tony Bianco's boots out here.